When it comes to sense of direction I rank really low. I heavily use Google Maps to find my way around, at least for the last two years now. 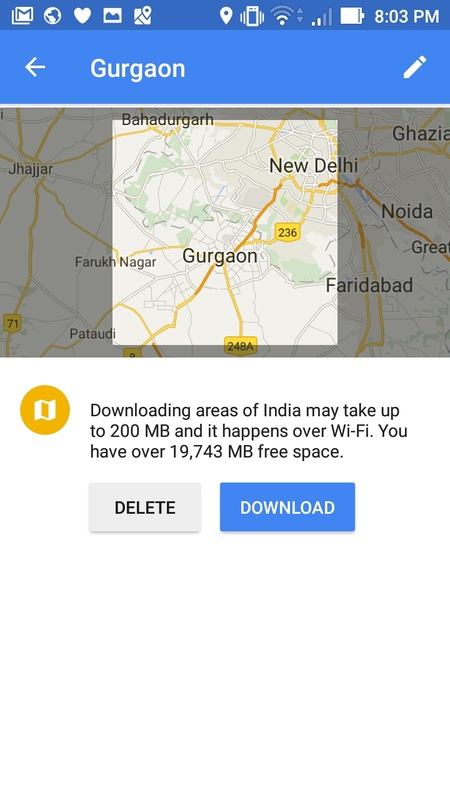 Before going to England I went on a sponsored trip with Google Maps in India. I learned many few useful tips and tricks there. I was looking forward to use them in London, particularly London Underground! This was my 6th visit to UK as I used to go there for work. My last trip however was in 2011. Apart from a few sightseeing opportunities in and around London I was self-sponsoring my stay in London. I went to England to sail on the Harmony of the Seas so my airfare and the sailing bit of the trip was sponsored by Tirun Travel Marketing. I hope I have disclosed all my association properly, how interconnected they can get! It made a lot of sense to stay back in London for a while and that is what I did. I was truly excited about using Google maps offline. I was hoping that I would not buy a data pack and save some money. Even before leaving, I figured out that only driving directions work in offline maps but I was hopeful that I might be able to make use of them to walk around! But before that come Oyster Cards! 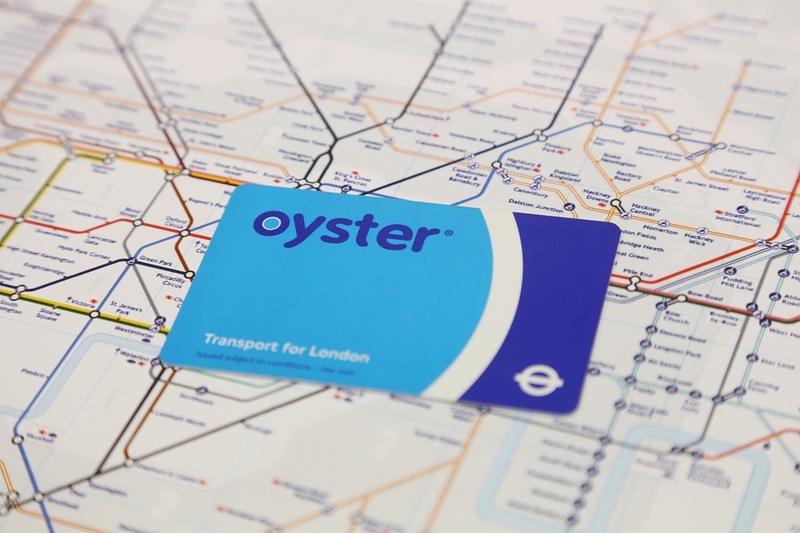 Oyster Cards- An Easy Way to Travel on the Tube! I planned to use London Underground to get around the city. I used it in 2007 and 2009 as well. Then I used to buy day passes for the tube. I knew there were Oyster Cards now. I bought a brand new one at Heathrow Terminal 5 Tube Station. I put in 30 pounds on it as I was going to use it for 4 days. It is ‘pay as you go’, I did top it up once for 10 pounds. For my zones (traveling between 1 to 4 mostly) the daily cap was 9.50 pounds. They charge a 5 pound security. You can return your Oyster Card at the Heathrow Airport Tube Stations and get the security back. They also refund any balance that remains. I got about 11 pounds when I returned the card! I am cool now in doling out gyan after the trip. I was actually quite nervous before the trip. The coolest bit of information about zones and daily caps came from the Tripadvisor Forum. If you are looking for buying an Oyster Card from Heathrow do check out the thread mentioned above. There are helpful people out there! London Underground- I am a Fan! My happiness in getting around London was then dependent on two things- an Oyster Card and Google Maps. I arrived at Hounslow Central Tube Station from Heathrow without any trouble, I had to go to Ibis Budget Hotel. It was supposed to be a 5-10 minute walk. After looking at the driving directions I started walking right. After walking for about 20 minutes, I decided to give up. I walked back to the tube station and asked a person outside a shop for directions. The hotel, like every other time, was in the other direction! I have done this so many times that I am not even surprised anymore. For me it is business as usual! That led to the question- to buy or not to buy a data card given that it was beyond my capability to use the offline Google Map directions in any meaningful way! At the hotel it was way too early for check-in. So I left my luggage with the hotel staff. They knew about me, as my student Chander Kaushik used to be the hotel manager. I was identified as Chander’s teacher by the staff! The first thing I did was to get a Data Card (Lebara) of 2GB for 10 Pounds. I was not too keen on getting lost at every opportunity. It turned out to be a wise decision in the end. Ready to Go with Google Maps! My first stop on the Underground was Golden Tours on Buckingham Palace Road. 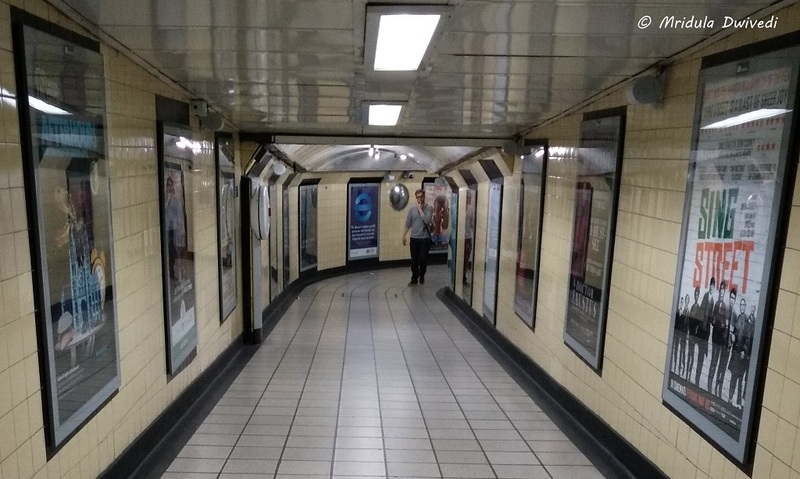 I realized that I would be taking the Piccadilly Line till Glouster Road then change to District or Central Line and get down at Victoria Station. From there it was .3 miles walk. See it was simple. I was able to do this for every destination I wanted to visit. Instead of driving directions I would look for Tube directions and it worked like a charm every time. Once again it is easy to write with confidence after the trip. I remember feeling confused at the first interchange from Piccadilly to District Line. But then the tube stations have excellent signage that even I can figure out. I took a tube in the wrong direction only once in my entire stay and that is really good considering my track record! Also in my previous visits I was map less so I would ask the Tube staff about the changes. They are awesome in dealing with customers in general. From here on life was easy. 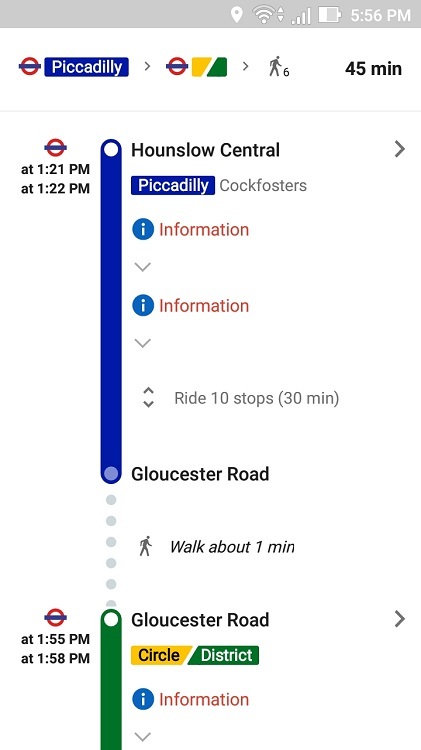 I would use my Oyster Card to pay and Google Maps to tell me how to get to a place using the tube and then on foot! I love walking anyway! I know that there are London Tube specific apps. But I relied on Google Maps because it works well and it is already on my phone. I am familiar with it and I can use it in another country too! 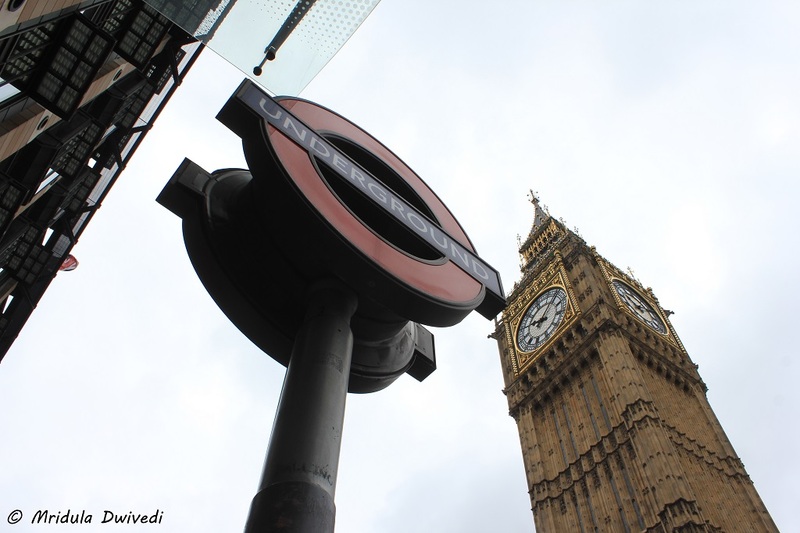 I had a good time using the London Underground and there are many more stories to share!!! I have said this before and I am saying it again, I can get lost in a telephone booth if it has two exits! Yet I love to travel. I grew up in the time of paper maps and they were like the toughest puzzle to me! Then came smart phones but I resisted them for long. Eventually I got on to smart phones and Google Maps. Life became a bit easier. But even with Google Maps I have often walked to the other direction realizing it only when my location moved away further from the dots! So when I got an invite from Google Maps to travel with them from Chandigarh to Kasauli I was happy to go on the trip! And what a voyage it was, about discovering Google Maps. But Where are We staying? A few days before the trip I asked the Google PR team, “So where are we staying in Chandigarh?” I got a reply that I would have to discover the hotel via Google Maps! 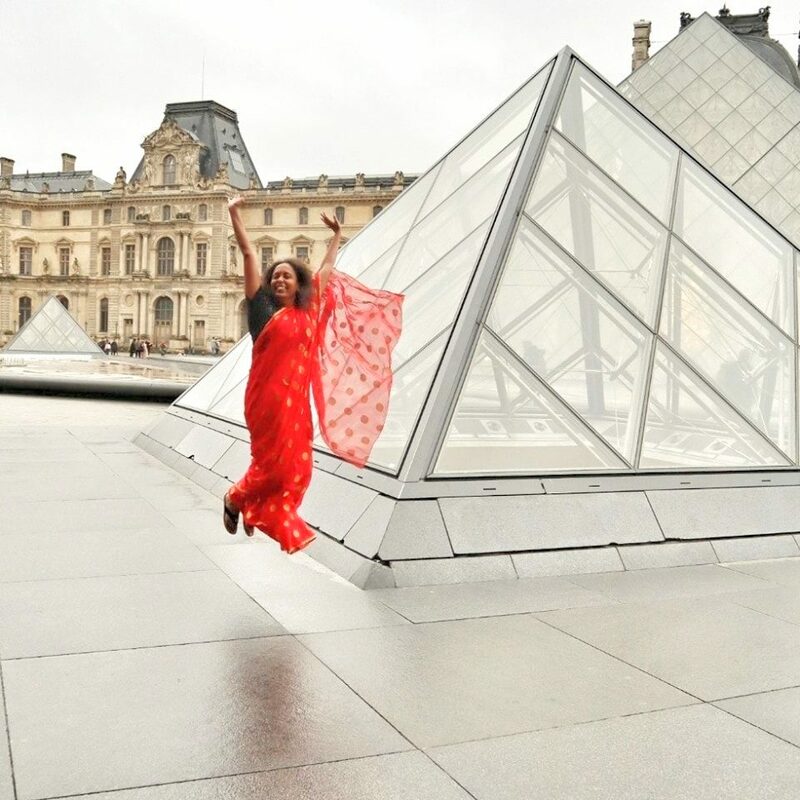 Now that left my family and me a little nervous but then fellow blogger Nidhi Joshi was also on the same trip! If we got lost, both of us would! Thankfully once we landed at the Chandigarh Airport the Google Team greeted us! They gave us the location on the map which was JW Marriott Chandigarh! They gave us separate cars too, so that each one of us would interact with the map in our own way! That is how the fun and a very useful journey started! Sanket Gupta, Program Manager at Google took us through the maps. I can follow that pattern here but I will go my own way. All of us know how to navigate from point A to Point B using Google Maps. But there is much more to the maps than it! Before sitting with Sanket, I was not even aware there was such a tab available for me to explore. Just by looking at the tab you can see there is much more to Google Maps! I will not be able to discuss everything from here but I will pick up the things that I found extremely useful for me, i.e. someone who has no sense of direction. But even before that, we need to know something called Google Maps Offline! Select the offline tab from the drop down, that I have shown in the first screen shot. It will let you download a map and save it to your phone. Next time when you don’t have an internet access due to bad connectivity or any other reason you can still use the Google Maps to find your way! No longer I am going to suffer poor connections that I get as soon as I exit the Metro Station at Rajiv Chowk! A word of caution here though. 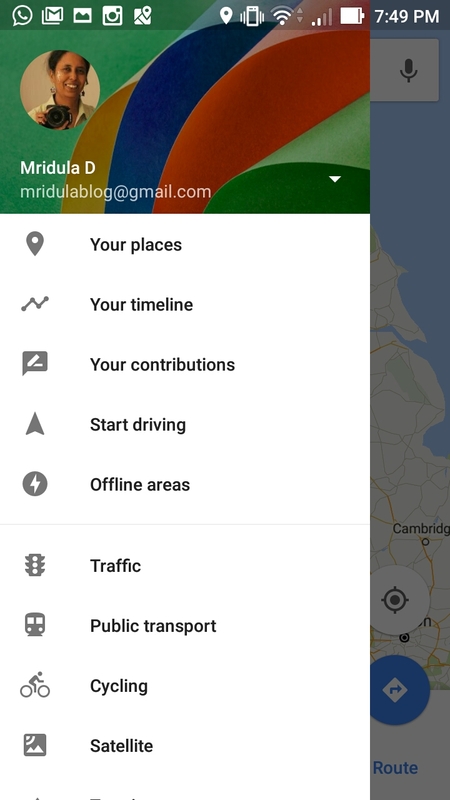 Only driving directions work in the offline mode. Walking and public transport directions will not work! 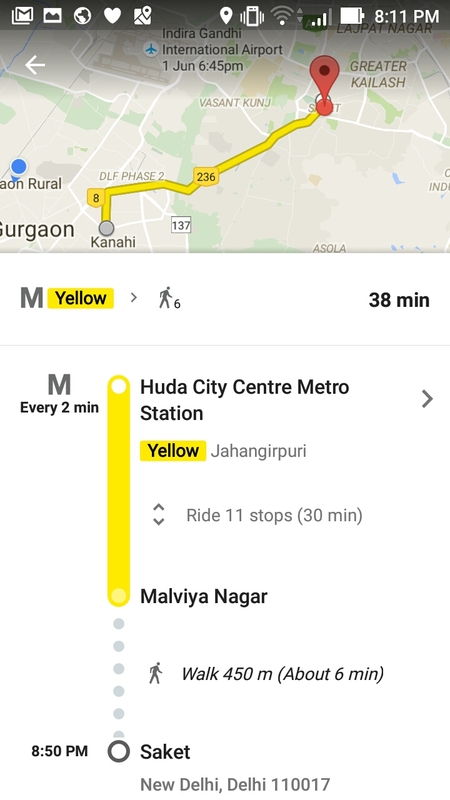 Find a Metro Route Using Google Maps! I wonder why I never noticed it on my own! I always tweeted asking people for the nearest metro station next to a place! You can find that right on the Google Maps. Not only Metro Route but you can find a bus route, walking route or cycling route too! Do you feel the route showed above is not correct? Or that anything on the map is not correct? Suggest an edit to the team! You feel something is not up to the mark with the maps? 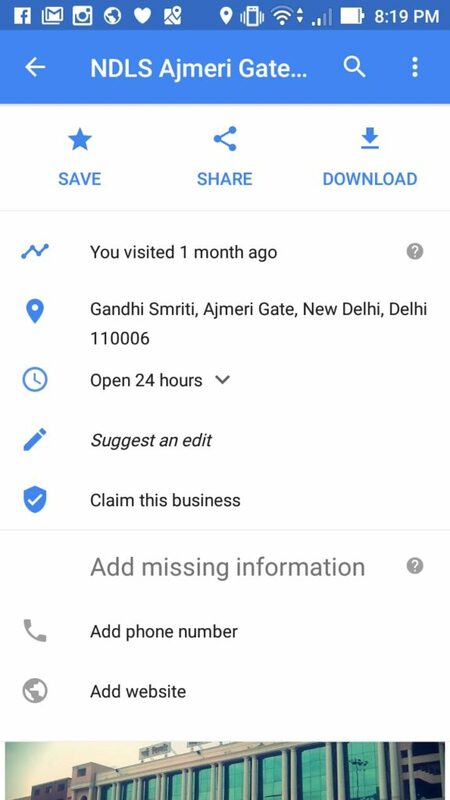 Anyone with a logged in account can suggest an edit to the Google Maps! When you find a place on the map, you need to tap on the bottom screen to get an expanded menu like the one in the picture above. Then use the suggest an edit link to the team. Every edit is reviewed and then approved. And if your review is approved you earn a point and that leads me to the next concept- become a local guide with Google Maps! When I started the trip from Chandigarh I had 1 point on the contributions board, I am already at Level 3 now! However I am desperately aiming at Level 4 which is 200+ points as it gives me enormous space for free on Google drive. (Update- I reached level 4 on local guides and got 1TB free space for two years on Google Drive. Yes it is one terabyte. I can upload all I want for two years and keep it. Won’t be able to upload more after two years!) You can start contributing too. Check out the page for how one can accumulate points on Local guides and what are the associated benefits. 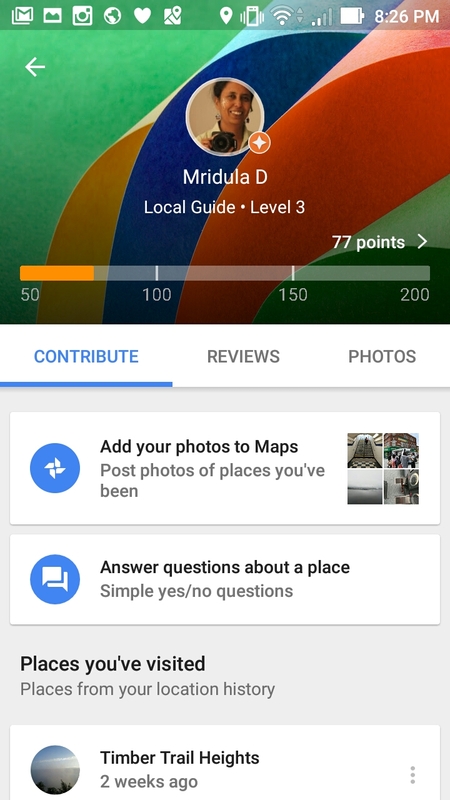 You can accumulate points by reviewing a place, adding a photo etc. At the moment I am having a gala time with the contributions feature! They take some time to approve photos but the review go online instantly! 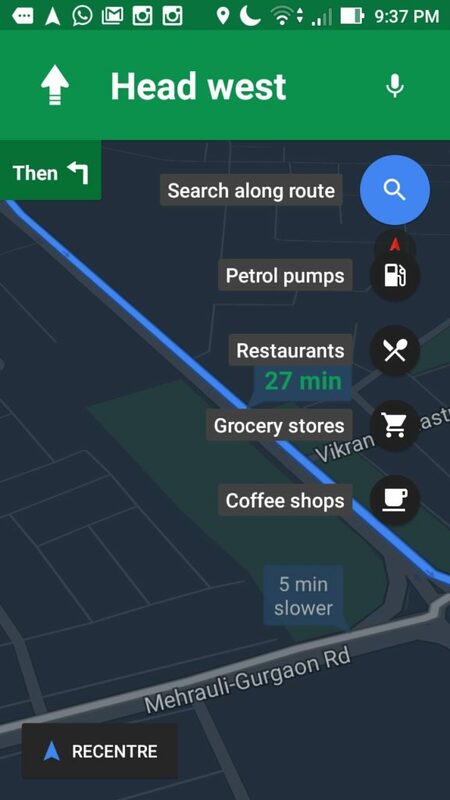 Now in the navigation mode you can search along the route for petrol pumps, restaurants etc. You can search by tapping on the search icon on the top right hand corner. Then when you find something where you would like to add, tap on it and add it as a pit stop. You can navigate to your stop and then continue to your destination! You can book a taxi right from your Google Maps. 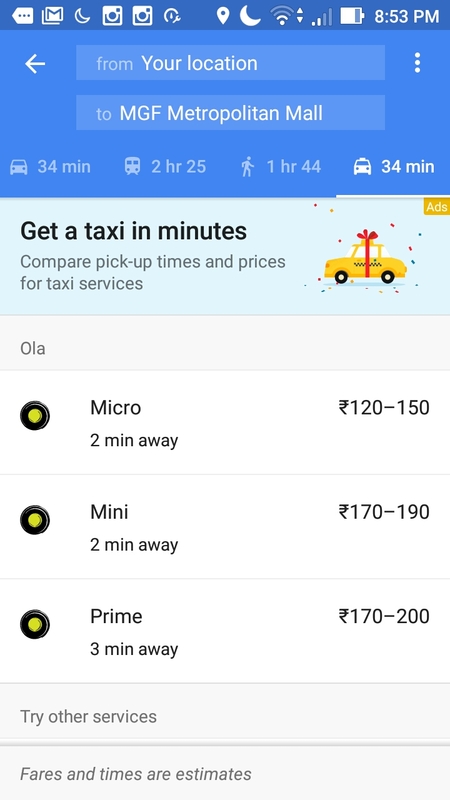 Instead of the car icon, choose the taxi icon to see the options. For this to work you should have taxi apps on your phone. I only have Ola on my phone hence it is showing Ola only. If you have both Ola and Uber it will show both the options! To me Google Translate feels like magic. To make it work offline you would need to download the language packs you wish to use. For example if you are going to Germany and wish to translate to English download both the packs. You also need to download the Translate App. 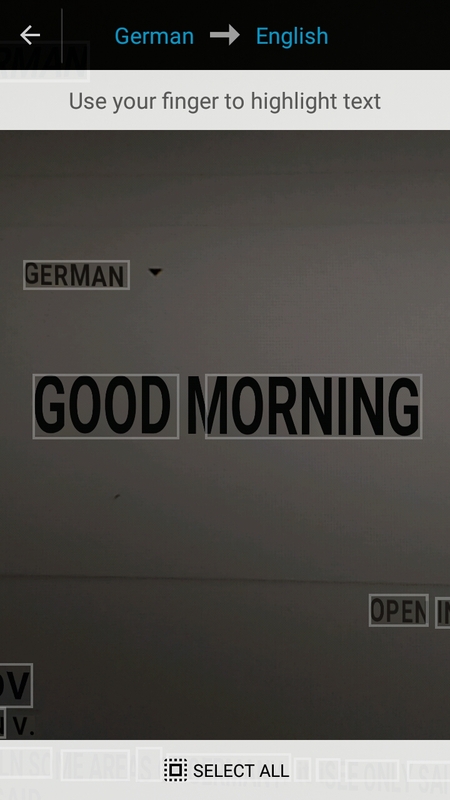 Now point your app in picture mode to anything written in German and you will see it in English on your screen! I am certainly going to put it to good use when I visit a non English speaking country next! When I showed this to my techie husband he did not agree to him it was not magic but to me it is! There is much more to Google Maps. Depending on the language your phone supports you can get the maps in Hindi! The maps give you estimated time of your journey and live traffic in the online mode. You might have noticed taxi drivers rerouting themselves on the map! You might be doing it yourself! Do give me your feedback, how did you find the tips? From my side I used Google maps in London a lot and I will review it in near future! But before that another trip is coming up!